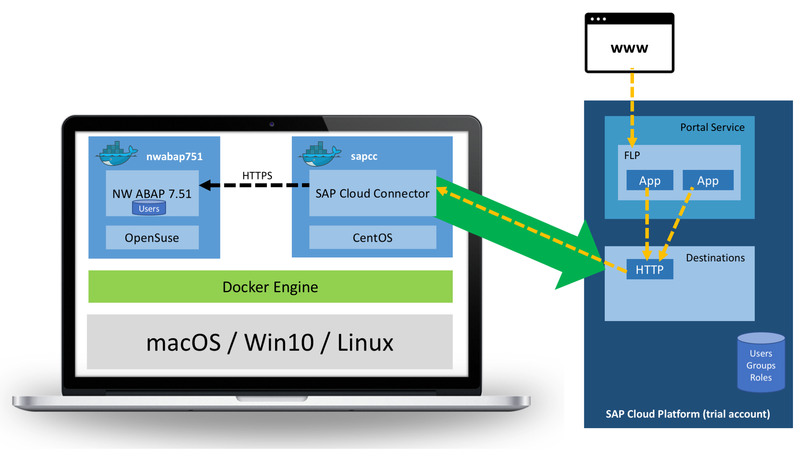 In the last two parts of the blog series you’ve learned how to smoothly install both the SAP Cloud Connector (SAPCC) and NW ABAP 7.51 SP02 Trial into Docker running on your own machine. This helps to avoid polluting your own system. You’ve also connected your SAPCC to an SAP Cloud Platform (SAPCP) account. But that was only some sort of small talk, now let’s start with the really cool stuff: connecting your two Docker containers and configuring everything to get the so called Principal Propagation to work. Again, you can watch a 34 minute video to see the whole configuration in action; we’ll continue where we’ve left off in the last part of the blog series. 2. What will you have at the end of this blog? So far, both our NW ABAP Trial and SAPCC are pretty naked; there is not much of configuration (yes, I know the NW ABAP Trial is actually well configured out of the box). In this blog we’ll start with configuring an HTTPS connection from your SAPCC to your NW ABAP. Later, this connection (a so called system mapping in the SAPCC) will be used when our apps running on the SAPCP call OData services implemented on our NW ABAP. When checking the connection from the SAPCC web UI we’ll see that for some reason the SAPCC cannot reach our NW ABAP. We’ll have to fix this by putting both Docker containers onto the same Docker Network. For a better understanding, this is like putting two physical machines onto the same local network using a cable so that they can reach each other. Part of the configuration is also to provide certificates which are then configured on both the SAPCC and NW ABAP. 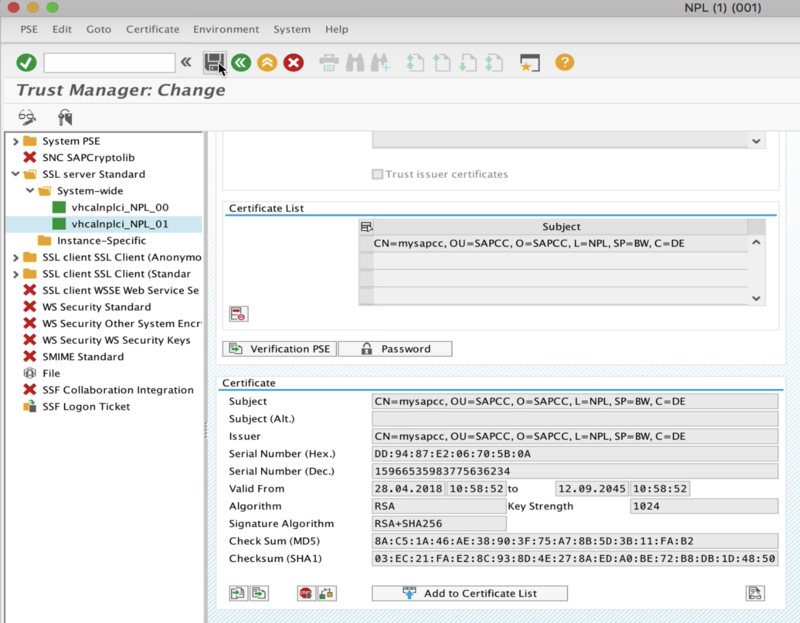 You’ll see how to generate the needed certificates using OpenSSL and how to configure both SAPCC and NW ABAP to use/trust them. 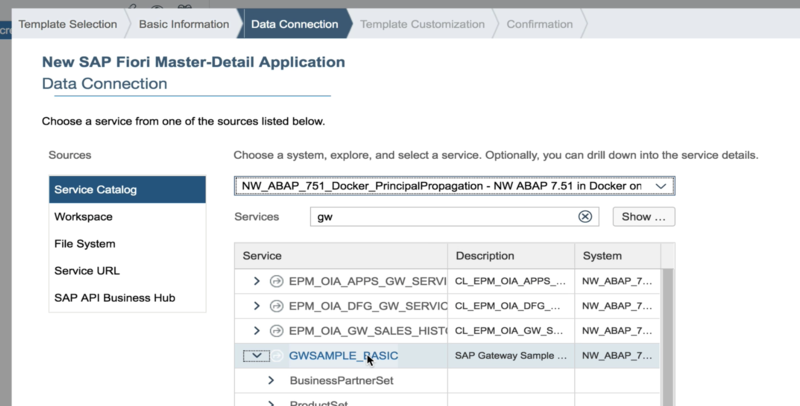 After a few other configuration steps on NW ABAP you’ll see how to create a so called destination on the SAPCP which basically connects to your NW ABAP through the SAPCC. In fact, we’ll create two destinations to illustrate the differences, one with Principal Propagation and the other one with Basic Authentication. For testing purposes we’ll use the SAP Web IDE to generate a simple good old fashioned Master Detail app using the SAP Fiori Master-Detail Application template. During the template wizard steps you’ll be asked to choose an OData service, which we will do by choosing the good old GWSAMPLE_BASIC service available on your own NW ABAP. Before you can select that service you’ll have to choose a system (basically the created destination) which is then used by the SAP Web IDE to call the Catalog Service of our NW ABAP (SAP Gateway) in order to list all available services. This call, of course, only works if the calling user (your user) is somehow authenticated on NW ABAP side; and that’s exactly the magic we want to see working. After finishing the Master-Detail template wizard steps you’ll see how easy it is to run the application from within your SAP Web IDE. 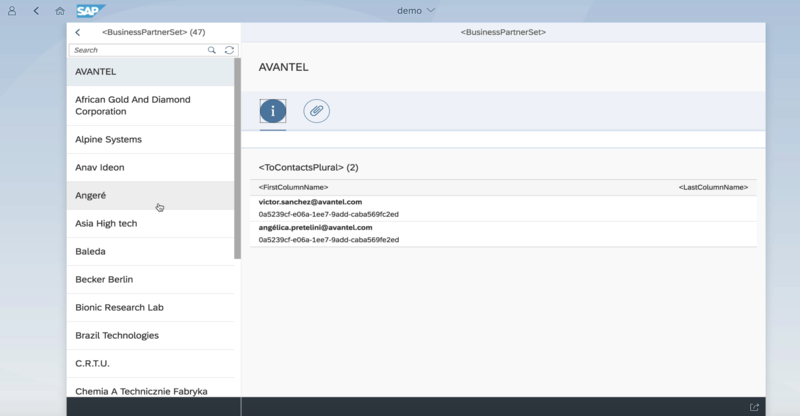 As a final step, you’ll also see how to create a simple Fiori Launchpad (FLP) in the SAPCP Portal Service and how to add our little application to that launchpad. After this you can call our app from a real FLP. And when you do this, the app opens up, calls the OData service on your NW ABAP using the destination you created in your SAPCP account, and displays all the data. The image above show exactly what your will have in the end of this blog (except we’ll only create one FLP app). 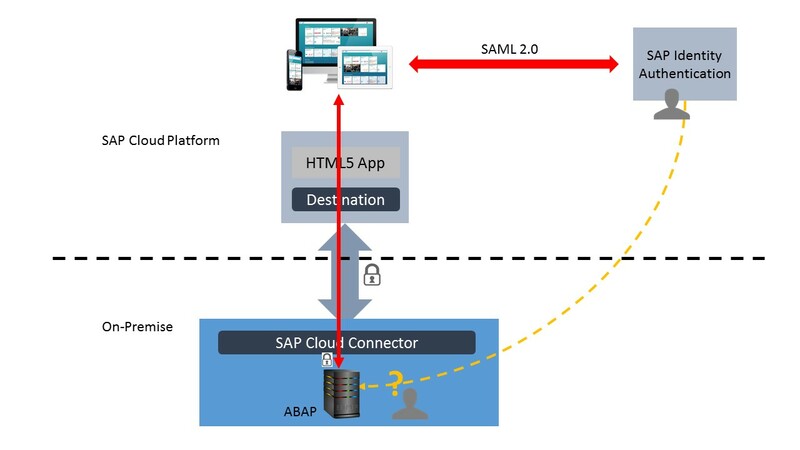 Please pay attention that both your NW ABAP and SAPCC are running on your own machine, while the SAPCP is not 🙂 Also, when you use your browser to open your app in the SAPCP it means your browser connects to SAPCP, and from there the SAPCP thanks to some magic knows how to connect to your local NW ABAP. Also note that the image shows two different user stores! Make sure to read the conclusion below! 3. What is Principal Propagation and why do I need it? Let’s assume you have created an FLP using the Portal Service of your SAP Cloud Platform’s account (you’ll see how that works in the video). After this you configure your FLP (Apps, Catalogs, Groups, Roles). Most probably some of your apps will communicate to your NW ABAP backend using OData via destinations configured in your SAPCP account. Requests going through the destinations will then be piped through the SAPCC which in turn manages the calls to the real ABAP OData “Endpoint” (SAP Gateway). The app calls an OData service implemented on your NW ABAP backend. In fact, the browser thinks the OData service is an HTTP call going to the SAPCP (account) while it’s actually a call to a so called destination which which forwards/proxies the original call to the SAPCC. The SAPCC receives the OData call and the user context of authenticated user (on SAPCP passed over by the destination). Taking this user context the SAPCC creates a short lived X.509 certificate and signs it (Kerberos is possible as well). Then the SAPCC forwards/multiplexes the HTTPS OData call together with the certificate to the right NW ABAP backend. The certificate is created for the user that calls the OData service from the SAPCP FLP. It serves for the authentication on ABAP side! That’s basically what we mean when we say the SAPCC handles Principal Propagation to the ABAP backend. Finally, the OData service gets executed. If your UserID on SAPCP was P1234567 then sy-uname inside the SAP GW OData service implementation (ABAP) will be P1234567 as well! Voila – how cool is that? 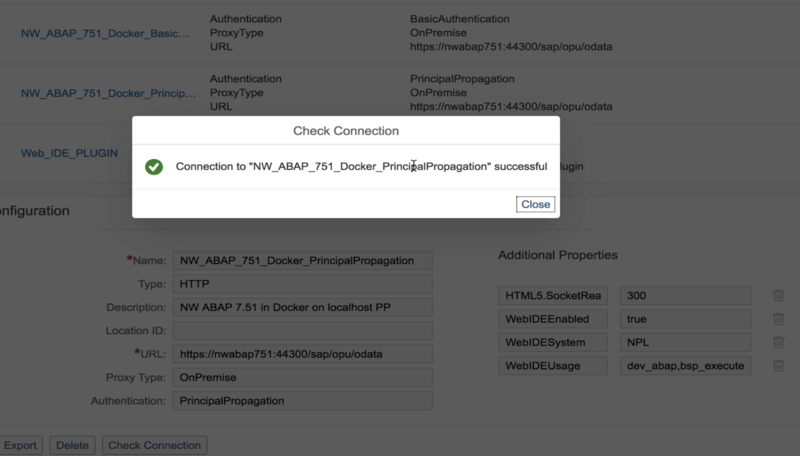 Reconsidering the steps above, we can say that for our scenario Principal Propagation means that the user who got authenticated on the SAPCP is recognized on NW ABAP! It’s important to note that the user must already be available in the ABAP user store (SU01) together will all the needed authorizations before the OData call happens, else NW ABAP will deny the request with an HTTP 401 response and the user will see a Basic Authentication dialog! In other words: Principal Propagation does not create users on ABAP side! This explanation should tell you that thanks to the SAPCC it’s quite easy to use your existing ABAP backend in the cloud! Your authorization checks on ABAP side still work just fine, even though the user got actually authenticated on SAPCP side! Awesome, isn’t it? Now let’s start to configure our SAPCC by setting up the System Mappings. The screenshot above is from the video (4:32) and shows you the result of our first system mapping. It connects a virtual host to an internal host. The virtual host is what you will see in the SAPCP later when we create so called destinations. The internal host is (in our case) a real NW ABAP running inside our Docker container. As you can see from the screenshot above we’re using the same hostname we used for our NW ABAP Docker container. It’s quite easy to create a system mapping, please have a look into the video. After creating a a system mapping you cold check the connectivity by pressing the corresponding action button. For some reason our SAPCC which runs inside a Docker container cannot reach our NW ABAP. Let’s fix this next. The first command creates a Docker Network called saptrial. The second command puts the sapcc container onto the Network saptrial and makes it available under the alias mysapcc (as you remember that’s also the hostname of our sapcc container). Finally, we put our nwabap751 container onto the same Docker Network saptrial and and use the alias vhcalnplci (the hostname of our ABAP container). After the first three commands we can re-check the connectivity of our system mapping. And guess what, everything is green this time (see screenshot below). For further details see my GitHub repo here. The connection to NW ABAP seems to be fine, but no resources are accessible yet. In other words, although the system mapping works our OData services cannot be reached yet because they are not whitelisted in the SAPCC for our system mapping. Check the video to see how easy it is to make resources available, but keep in mind that we chose “/” as the URL Path because we are a little lazy (in prod you would often rather choose exactly what you want to publish). This will generate a bunch of files for you, but we only need the files intermediate.p12 for our SAPCC and SAPCC_CA.crt for our SAP NW ABAP. In case you have problems with the commands above you could simply use the files I generated for you. After having the certificates generated we want to use the generated intermediate certificate intermediate.p12 for our SAPCC. Choose Configuration on the left-side pane and then clock on the tab ON PREMISE. At 10:26 in the video you can see how to upload that one certificate to your SAPCC in order to use it both as your System Certificate and CA Certificate (this takes only a few seconds). Now let’S start the NW ABAP configuration with transaction STRUST. We fire it up because we want to tell NW ABAP to trust the generated CA certificate SAPCC_CA.crt. Simply import the file and afterwards add the certificate to the certificate list by pressing the corresponding button. For all the details follow the video at 11:30. Don’t forget switch to save when done! After this step you wanna go to transaction RZ10 because you need to change a few profile parameters. The configuration allows us to define what certificates will actually be trusted based on the Subject and Issuer. The values for the first two can be copied from the SAPCC, see the video for details. The third parameter allows us to automatically map SAPCP users to ABAP users. Now you wanna go to transaction SU01 and add a user. In our demo, the User ID must be the same as the one you use on the SAPCP. In case you are using a trial account it’s most probably something like P123456 (no “trial” at the end), but it could be a C/D/I/S-User as well… Make sure to give that user SAP_ALL; that’s only to speed up with the demo, in production you would not do that! Now go to transaction code CERTRULE. Here we can make sure the SAPCP users are mapped correctly to the ABAP users. For this step, first we go back to the SAPCC and create a sample certificate. Finally we can upload this sample certificate file in CERTRULE and do some configuration (see video). In case you missed something: the video contains all the details! This is real data coming from YOUR own NW ABAP! And you’re getting the data without being asked to enter any credentials because Principal Propagation just worked! In case you don’t see any data you might have to generate some sample data; see the video for details. And the best part is that you can share the link to your FLP with your friends and they can call your apps as well! The only thing you have to take care of is creating a corresponding user on your NW ABAP in SU01, and that user must be the same as the one used to logon via SAP Authentication Service (aka SAP ID). This basically means your friends need a user on SAPCP (which is free). You don’t like cloud because your data has to be in the cloud? Well, not so true as you might know by now. This demonstration clearly illustrates that the data is and stays on-premise! If you stop the SAPCC then your data is not available via SAPCP anymore! Your data is piped through SAPCP infrastructure(s) at runtime, i.e. anytime a user opens an app in your FLP which calls an OData service on your backend (via destinations + SAPCC). I guess you have to trust that SAP and their infrastructure partners (Google, Amazon, Microsoft,…) don’t do some kind of “deep inspection” of the data piped through their infrastructure (for whatever reason). But be aware that cloud providers are monitoring companies, that means they need and have tools for monitoring to make sure the cloud is up and running as good as possible (I hope they don’t monitor clear text passwords in log files…). But hey, don’t we trust the internet and the internet providers? I should better stop to elaborate here too much. However, if you ask me, I don’t think cloud providers want to kill their cloud business and thus I do have lots of trust – at least for SAP (not so sure about Google…). Back to the topic… So far Principal Propagation works just fine. As you know your user data is on ABAP side (neglecting the SAPCP user). We have an FLP on SAPCP, but how can we configure the authorizations for seeing certain apps in the FLP? We could do that on SAPCP side. However, we have an ABAP server, and we want it to be our main user store. Furthermore, let’s assume we have all ABAP roles, processes, and tools etc. to create users on ABAP and assign them there the needed authorization. Wouldn’t it be cool to somehow sync the users to the SAPCP so that based on the ABAP users and authorizations the SAPCP FLP knows what apps to show?